The Cleveland Cavaliers were given a dose of reality in their second game away from home, but will look to put in an improved performance when they host the Golden State Warriors in Game 3 of the NBA Finals. Join The Roar for live scores and coverage from 11am (AEST). The Cavs came up short in both of the first two games on the road, but after pushing the Warriors juggernaut to overtime in the series opener, they will be somewhat confident of their ability to force an upset in the third game back at home. LeBron James has had a couple of enormous games to start the series though, putting up 51 points in the first game. He will need more support from his teammates, which he seemed to get at times during Game 2. JR Smith and George Hill had good, aggressive games, while Kevin Love also put up reasonable numbers. If the trio can continue to support LeBron and the Cavs get some output off the bench, they will be a red-hot show of getting a result. In the Eastern Conference semi-finals, they were terrible on the road for all but the final game, all the while being brilliant at home. While their level seems to lift when they play at the Quicken Loans Arena, this is not the Boston Celtics – a young and inconsistent, yet fantastic team. This is the Golden State Warriors. The Warriors with four NBA All-Star calibre players and two of the best shooters this game has ever seen in Stephen Curry and Kevin Durant. While the defending champions skipped away to a big win in Game 2, the scoreboard isn’t quite an accurate or fair reflection of the level of fight Cleveland put up during the contest. 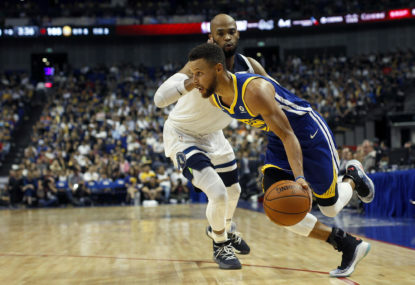 They were in and out, but in the end, it was simply always going to be a tough ask to stop Steph Curry, who set a new NBA Finals record by sinking nine three-pointers. With Durant aggressive, Draymond Green playing his best game in ages and Klay Thompson chipping in, losing at home just wasn’t going to happen. Hitting the road, they need a similar sort of performance shooting, where they finished with over 50 per cent last time out. Do that and the Cavaliers will struggle to keep the scores low enough for a shot at winning. The Cavaliers are back at home and I’ve always expected them to win at least a game in this series. They showed they could match it on the road and with an improved performance at the Q, LeBron should be able to get them on the board. Be sure to join The Roar for live coverage of Game 3 from 11am (AEST) and don’t forget to add a comment in the section below.